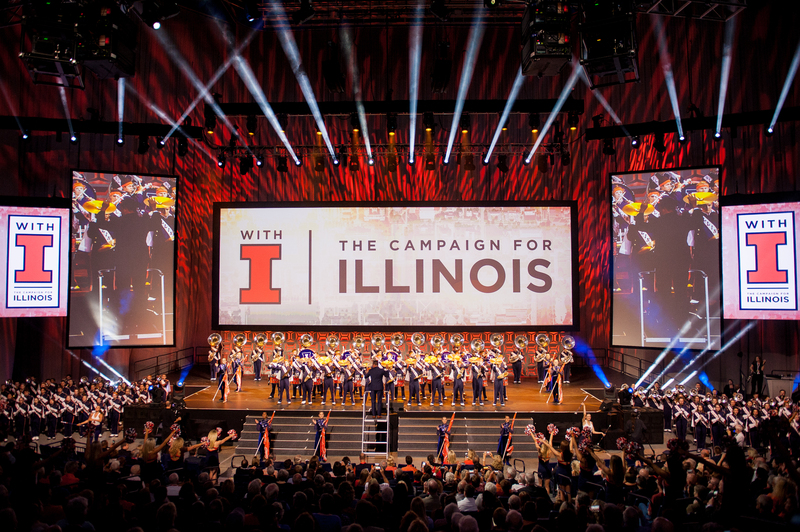 The University of Illinois launched a new fundraising campaign in October, and UVLD was there to light the event in partnership with Level5 The Expo Group, executive producer Paul Sander and account executive Michael Preston. In a jam-packed, hour-long program, the event showcased the facilities and many extraordinary students, faculty, and alumni of the University of Illinois. The lineup included an astronaut, a Nobel Prize winner, hip hop dancers, two dogs, a prosthesis developer presenting in tandem with a beneficiary of his work, an a cappella group, a poetry jam, a wide array of presenters, and the extraordinary 300-person marching band of the Fighting Illini. The show occurred in the State Farm Center Arena on the Champaign Urban campus. The setup consisted of a main stage with a flying atomic drop upstage and five content screens. The design made use of a vast expanse of drape preexisting in the venue which provided the perfect lighting canvas to support the wide variety of show content. Jeff Nellis was the lighting designer for the event, supported by Matthew Piercy programming and the incomparable Christopher Nye as Production Electrician. Technical Direction was provided by Steve Dumbacher and Creative direction by Micki LeSueur. Lighting equipment was provided by PRG. The lighting rig consisted of 51 PRG Best Boy HP Spots, 28 Clay Paky Mythos, 20 Colorforce 72, 33 Martin DX Wash, 11 VL3500 Spots, 4 Radiance Hazers, and 2 GrandMA2 Full Size lighting consoles.